Funeral services for Mr. Roosevelt Wilborn of Lambert Street, Americus, Georgia will be held Saturday, July 29, 2017 at 10:00 A.M. in the Chapel of West's Mortuary in Americus, Georgia with Rev. George F. Monts officiating. Burial will follow at Eastview Cemetery. Roosevelt Wilborn, son of the late James Wilborn and the late Mamie Mae Rush Wilborn was born on June 4, 1957 in Americus, Georgia. 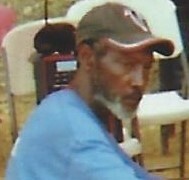 “Roach” as he was affectionately called, enjoyed doing carpentry work and he loved sports, especially the Atlanta Falcons. He passed away on Thursday, July 20, 2017. Preceding him in death were two sisters:Pearlie Longstreet and Ann Wilborn, a daughter, Kyanna Wilborn and a brother Charlie Rush. Left to cherish his memory is his son, Jeremy Boone of Americus, Georgia; six brothers: James Wilborn, Jerome Wilborn, Willie James Wilborn, Leon Wilborn, Robert Lee Wilborn and Henry Lee Wilborn all of Americus, Georgia; four sisters: Ms. Margie Ann Wilborn, Ms. Barbara Ann Wilborn, Mrs. Lois Davis and Ms. Shirley Ann Wilborn all of Americus, Georgia; four aunts: Mrs. Shirley (Eddie) Robinson of Vero Beach, Florida, Mrs. Laverne (John) Williams of Desota, Georgia, Mrs. Eula (James) Merritt of Americus, Georgia and Ms. Martha (Randy) King of Cordele, Georgia and a devoted aunt Ms. Edith McKnight of Americus, Georgia; two uncles: Cleveland Rush, Jr and Sander Rush both of Vero Beach, Florida; one grandchild, a host of nieces, nephews, including two devoted nieces: Terriann Sims (Brandon) and Latricia Wilborn both of Americus, Georgia. Several other relatives and friends also survive. While words fail to capture the pain of losing a loved one, please look forward to the time when words will fail to capture the joy of having our heavenly Father return your dear loved one to you.